I first made this salad last summer for our annual stampede BBQ. The original recipe actually comes from Campbell's (yup, the soup). Over the course of the summer I tweaked the ingredients and quantities used to suit my tastes. Then, winter hit us hard. 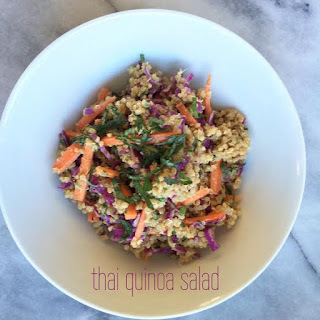 I sort of forgot about this delicious little salad because the slow cooker and warm, comforting dishes took over this household. Finally, gorgeous spring weather has been emerging here in Calgary, and it got me thinking about spring and summer salads again. I can't believe I forgot about this one. The red cabbage, carrots and peanuts give it just the right amount of crunch. The dressing is bursting with rich peanut flavor with a tangy zip of lime. The bits of Thai basil and cilantro lend so much freshness to every bite. This is the perfect side dish to any grilled meat, or a super fresh and filling lunch all on its own. I've made it twice in the last month, and I'm sure there will be many more batches of this to come! 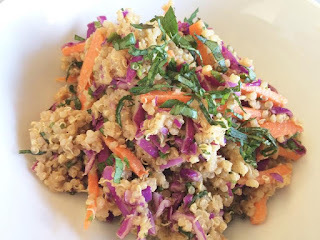 So, here we go....my version of Thai Quinoa Salad (adapted from the original recipe, which can be found here.) The basic ingredients are much the same, I just changed the proportions that I found to be most delicious. Combine quinoa and vegetable broth in a small pot with a tight fitting lid. Bring to a boil. Reduce heat to low and simmer, covered, for approximately 20 minutes, or until all liquid has been absorbed. Remove from heat and allow to rest, covered, for another 20 minutes. Fluff with a fork and transfer to a medium (about 6 to 8 cup capacity) bowl. While quinoa is cooling, prepare remaining salad ingredients and dressing. Whisk together all ingredients. Pour over the quinoa and other salad ingredients and gently stir it all together. Refrigerate for a couple of hours before serving for best flavor. You can garnish with lime wedges and additional peanuts, too.